Tissue engineering aims to regenerate, repair and replace dysfunctional or deceased tissue/organ and is an attractive solution to the current issues faced with organ transplantation. Most research strategies for engineering a functional tissue involve the encapsulation of cells within three dimensional (3D) matrices. Hydrogels, which are a class of polymers that are capable of absorbing water, have arisen as potential candidates for cell encapsulation matrices due to their similarity to the native extracellular matrix (ECM) surrounding cells in the body. Moreover, this highly hydrated environment also allows good permeability and diffusion of nutrients and oxygen through the network to the encapsulated cells, as well as waste products released from the cells to the environment. 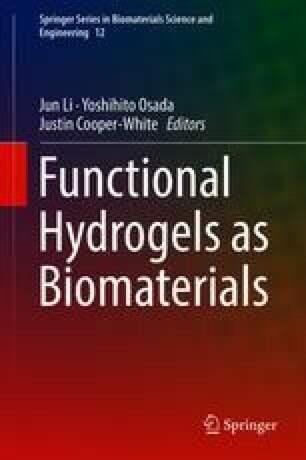 In this chapter, the advantages and disadvantages of hydrogels fabricated from various materials will be reviewed, with highlights on biosynthetic hydrogels. These hydrogels which are designed to have tailorable physical properties as well as the desired biological attributes are potentially suitable as cell encapsulation matrices.